TORONTO--(Marketwire - January 21, 2011) - Make this year's "Family Day" a holiday to remember with remarkable savings at one of the premier Toronto hotels where families are welcomed with special amenities for the kids and a 20% discount for mom and dad. Families can experience all the sights and sounds of Toronto and create a special family getaway with the "Holiday Family Package" at the Toronto Marriott Downtown Eaton Centre Hotel when staying two or more weekend nights now through Feb. 20, 2011. In addition to deluxe guest room accommodations in a luxury hotel in Toronto, this money saving holiday package includes two in-room children's movies, a children's snack pack and complimentary late check-out of 2 p.m. With rates starting as low as $147.25*, families can spend some fun quality time together without breaking the family budget. Connected by an indoor walkway to Toronto's most popular shopping complex the Eaton Centre and within walking distance to the theatre and entertainment district, the CN Tower, Royal Ontario Museum, Hockey Hall of Fame, Chinatown, Air Canada Centre; guests at the Toronto Marriott Downtown Eaton Centre are just steps from a world of fun and breathtaking panoramic views of the city. In addition to sophisticated hotel suites, downtown Toronto offers something for everyone including a variety of award-winning theatrical presentations, fine dining and world-class shopping. 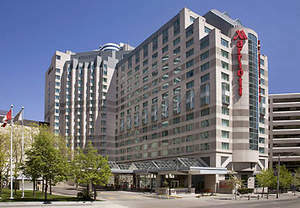 Families may check availability and book accommodations by using promotional code HOL at http://www.marriott.com/hotels/travel/yyzec-toronto-marriott-downtown-eaton-centre-hotel/ or by calling 1-888-236-2427. Distinctive among hotels near Toronto Harbour, the Toronto Marriott Eaton Centre Hotel offers guests stylish accommodations designed with Marriott Plug-In panels so it's easy to keep everything charged and connected. All rooms feature high-speed Internet access, cable/satellite service and plush featherbeds with down comforters. In-room coffee/tea service is provided and room service is available as well as a concierge level for added amenities. *Rates are per room per night and valid for Thursday-Sunday stays through 2/20/11 based on availability at the time of reservation. Guests must stay two weekend nights. Offer does not apply to groups of 10 or more rooms and may not be combined with any other discount or promotion. Please visit hotel website for additional terms and conditions. The Toronto Marriott Downtown Eaton Centre Hotel welcomes guests with sophisticated style and elegance befitting the downtown area and those who visit. In addition to spacious guest rooms and hotel suites, the Marriott offers more than 18,000 square feet of flexible event space, including seating for 800 in its largest meeting room, making it an excellent venue choice whether planning a corporate business conference or elegant social gathering. Conveniently located near the Metro Toronto Convention Centre, the hotel staff includes professional event managers and full-service caterers to meet the specific needs of every event.